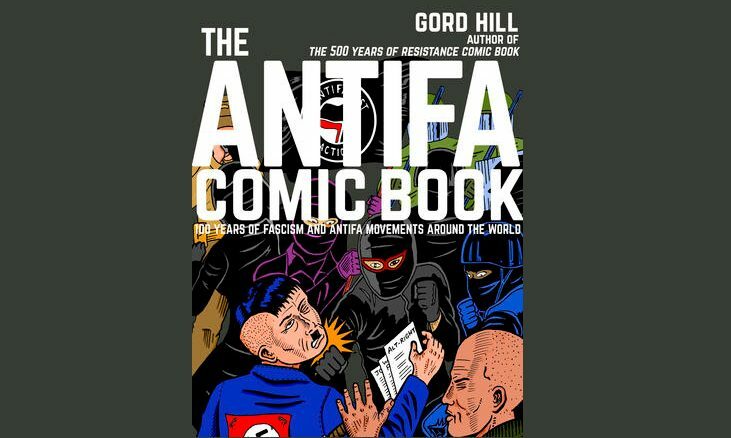 We share this interview by It’s Going Down with Gord Hill about The Antifa Comic Book in anticipation of upcoming launch events this month in Toronto, Ottawa and Montreal. In this episode of the It’s Going Down podcast, we talk with long time indigenous author, artist, and organizer Gord Hill, who for decades has written under the pen name Zig Zag. While Gord is perhaps best known for documenting indigenous struggles across the so-called Americas, in his newest work for Arsenal Pulp Press, he takes on the history of fascism and resistance to it over the past 100 years in, The Antifa Comic Book: 100 Years of Fascism and Antifa Movements, which also features a forward by Mark Bray. Our conversation touches on some of the major historical lessons that Gord has drawn after months of research and writing, largely that European electoral political parties often sabotaged street level and armed resistance to fascism and Nazism, paving the way for the success of these movements in gaining power. We also discuss the connection between colonialism and fascism’s drive for conquest and expansion, and touch on the current situation in the US around immigration and evolving social movements. The Antifa Comic Book: 100 Years of Fascism and Antifa Movements offers up decades of complex history in an easy to understand and digestible comic book form, without losing any of the major historical lessons and analysis. The book is perfect for people new to antifascism, and leaves the reader with a solid understanding of world events that can inform social movements of today. But The Antifa Comic Book is simply the latest work in a growing collection of seminal texts that Gord has produced. For years Gord has written and published Warrior Publications, both a news blog and at times a magazine on anti-colonial Native resistance struggles, while also publishing theory and tactical guides for revolutionary movements. Gord for years has also worked within and written about the anarchist movement and the common threads between it and anti-colonial Native resistance. Gord’s work has had a huge impact on It’s Going Down and the contemporary anarchist movement, and texts such as 500 Years Of Indigenous Resistance should be essential reading for all anti-capitalists and anti-racists. Needless to say we are honored to have him on our podcast and hope you enjoy our discussion.